The Comet: Vappu in Paris! I mean... it was still nothing compared to Vappu in Finland, it didn't even feel like Vappu because there wasn't this special Vappu-feeling. People don't celebrate the 1st of May over here so there was no partying. And people just looked very strangely at me and Sophie when we walked around with our student's caps on. Some of the stuff my parents and Sophies husband had brought us, but we actually found a finnish shop here in Paris too! It's close to where Sophie lives and is called "Kiva". But it's very, very expensive, so we actually only bought the cloudberry-jam over there and some more Karelian pasties. For example one 33cl can of the beer Koff was someting like 2,20€ in the shop... So I guess you get the picture now! 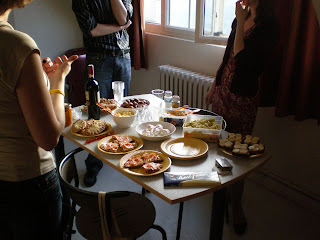 With the food we of course also had some snaps. But since we didn't find finnish vodka, we took polish in stead :D Sophie had her Historicus songbook with here, so we tried to teach some swedish drinking-songs to the others but it didn't go so well *lol* But we still sung five different songs. Later we moved on to Salmari and even though the samiak-candy it self wasn't such a success, the salmiak-vodka was considered much better. Yay! The next morning I actually got up a bit earlier just to listen to some of the springsong sung by the choir in the park of Kajsaniemi that I happened to have on my computer. 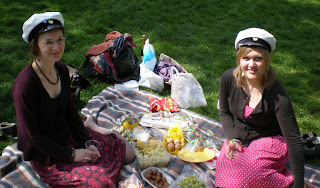 Then I went to meet the others for a picknick in Parc des Buttes Chaumont, a very beautiful park in north-eastern Paris. We sat there all together someting like five hours eating and drinking champagne, me and Sophie with our student's caps on and surrounded by colourful streamers. Although Sophie had to leave early to catch a train. But the rest of us stayed till the afternoon. And it was so warm outside! So perhaps that was also a reason why it didn't feel like Vappu, because it's never so warm in Finland on the 1st of May! This was more like... Midsummer! Or even later on during the summer.